Two new books by Professor Nancy Shoemaker illuminate the extraordinary lives of young men from Northeastern Indian communities–from Long Island to Martha’s Vineyard–who ventured forth into the expanding maritime world of the 19th century. American whaling vessels, faced with declining numbers of whales in nearby waters, were regularly forced to seek out more distant hunting grounds, as far away as the Arctic Circle and the South Pacific. In the process, their crews, typically comprised of white Yankees, Native Americans, and African Americans, were exposed to unfamiliar new environments and peoples. These mariners typically returned home with colorful tales of novel lands and seas as well as a greater awareness of the diversity of humankind. They often described eye-opening encounters with indigenous peoples in places like Hawaii, Polynesia, New Zealand, and Australia which, of course, had their own cultural mores and social relations. Today many historians regard the U.S. whaling fleet as representing the vanguard of American global capitalism and imperialism as merchants, missionaries, and settlers, as well as scientific and naval expeditions followed in its wake. American whalers, whatever their backgrounds or origins, found themselves perceived equally by indigenous populations as foreigners and outsiders. Shoemaker’s Native American Whale Men and the World: Indigenous Encounters and the Contingency of Race presents an impressive array of original archival research on the experiences of individual American Indian men who participated in the voracious hunt for whales. Increasingly dispossessed from their native lands and marginalized by white society, young men from indigenous communities, including on Long Island, sought economic opportunities and respect on the high seas that often eluded them at home. After alighting in an intriguing new place, a few American Indian men even opted to stay and assimilate into the local community while their ships sailed on. In her careful analysis, Shoemaker demonstrates that Native American men’s reception by indigenes in other parts of the globe reveal much not only about the cultural differences between their respective societies but also about the contingent nature of racial concepts, at home and abroad. The book, divided into the four sections of “Ship,” “Beach,” “Islands,” and “Reservation,” demonstrates how subjective definitions of race, ethnicity, and social status were for Native American mariners depending on the location. Within the confines of the ship, the racial hierarchy that governed social relations in the United States, relegating people of color to a subordinate class relative to whites, was often suspended. While shipmates were not “color blind,” they accepted, by and large, that when facing the dangers of the sea, a man’s status was determined more by his skills, level of experience, and earned rank than by the melatonin in his skin. Other historians, most notably W. Jeffrey Bolster in Black Jacks: African American Seamen in the Age of Sail, have similarly argued that the peculiar requirements of shipboard discipline prioritized ability over race, at least temporarily, within the confines of a vessel at sea. Shoemaker further complicates Bolster’s argument by focusing on Native American whalers and those of mixed-race parentage who further unsettled racial binaries. Stepping from their ship onto remote beaches and islands, American Indian men suddenly became part of an invasive alien force, which Shoemaker sees as replicating earlier cycles of conquest; at the same time, they were also witnesses and survivors of similar processes in which the “wealth and human resources expropriated from one place became a building block to colonization in another place.” (p. 93) Shoemaker considers how this reality may have unsettled American Indian whalemen’s sense of self, as they found themselves cast, for a change, in the role of non-natives. 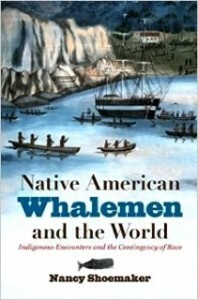 In particular, she asks readers to ponder what, if any, affinity a Shinnecock or Montauk whaler may have felt towards indigenous people in other lands, who were likewise labeled arbitrarily by Europeans as “Indians” and characterized condescendingly as uncivilized, primitive, savage, innocent, childlike, or naive. Most astonishing, Shoemaker also tracked down the descendants of Native American whalers who stayed and made new lives on Pacific Islands, in New Zealand, and elsewhere to learn how they accommodated these shifting identities and what historical memories of transnational kinship they retained. In the concluding section of the book, Shoemaker considers the outcomes for men who returned to Indian reservations in New England after their whaling adventures. Many who succeeded at sea brought home earnings that enabled them to acquire land, build houses, and improve their families’ standard of living. They gained status in their communities and some even took on leadership roles. Beyond the reservation, however, they still faced racial prejudice and discrimination. Ironically, even as whaling became central to myths about Yankee ingenuity, industriousness, and prosperity, Native American whalemen’s vital contributions to that endeavor were seldom fully acknowledged by the broader American society. 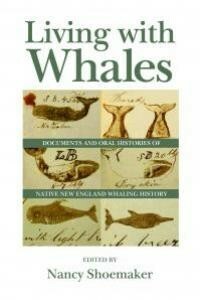 Shoemaker’s second book, Living with Whales, is an edited volume of primary source materials designed for classroom use. Each chapter includes a brief essay detailing key periods in the development of New England whaling (including Long Island), drawing on the research and arguments addressed in greater depth in her full-length monograph. These are followed by a selection of historic documents, ranging from 17th century whaling contracts to 19th century diaries, and oral history excerpts with the descendants of Native whalemen. With regard to the rigors of long-distance commercial whaling, Haile and Davis recognized both benefits and risks. The women recalled positive associations with specific historic houses on Shinnecock land that were built with hard-earned “whaling money.” Families’ ownership of these modest structures was made possible by their fathers, sons, and brothers who spent literally years of their lives at sea. Likewise, both Haile and Davis vividly described the disastrous wreck of the Circassian on the south side of Long Island in 1876 when ten Shinnecock whale men died in the attempted rescue. This tragic event reverberated through the entire community at the time. Today, it remains a touchstone for the Shinnecock, reminding them of the dangers that their ancestors courageously faced when they signed onto a whaling ship. With its compelling array of historic documents, interviews, useful bibliographies, and an afterword about the challenges of researching Native whaling history, Living with Whales is an excellent resource for use in the classroom as well as for general readers. Through its pages, Shoemaker traces the trajectory of her investigations and offers insight to the methods used by a professional historian. Making her research and interpretive approaches so transparent and accessible to students and others through this sort of volume is commendable and hopefully will be emulated by other scholars and academic presses.